It now really feels like baseball season is back! 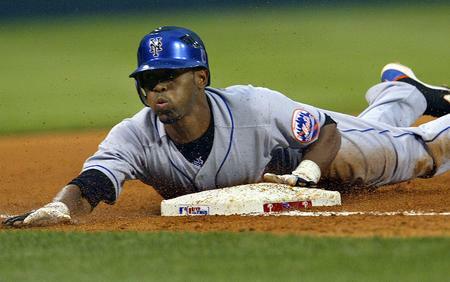 It’s been a year since I had the chance to watch one of my all-time favorite baseball players play–Jose Reyes. Every time he takes the field he plays baseball with immense passion, intensity and a love for the game. Few players appear to have such genuine fun. Growing up, I always thought Ken Griffey Jr. to be such a player and always sought out the opportunity to watch him play (remember, this was pre MLB.com where you can now watch ANY game). It’s a totally different experience watching a baseball team play with a Jose Reyes on the roster and no team could use such a boost more than these Mets. They are caught in a vicious cycle of negativity. After an impressive showing on Opening Day, the team has looked like the old, flat and stale team that it has become with Omar Minaya at the helm. It’s been almost a year (well 11 months, but feels like a year) since Jose Jose Jose took the field and my hopes are tempered, however a part of me believes that just as quickly as the team collapsed, so too can it snap back equally as fast (thanks stock market for the inspiration! ).